I am not an overly emotional person, and I love my binge-watching sessions of streaming video wherein I try to catch up to Breaking Bad before the finale so everyone doesn’t ruin it for me (successful, by the way), but something about watching this video explaining video stores to today’s youth, well… It got to me. 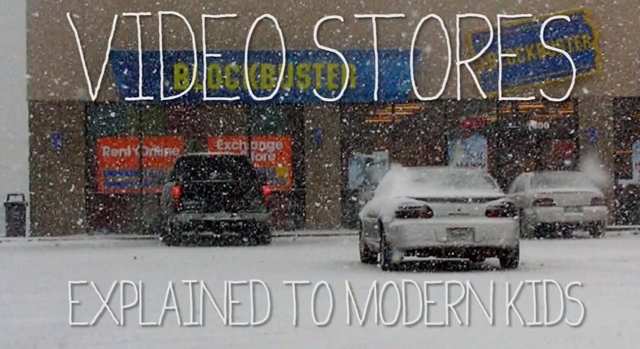 It’s a simple tale told by BuzzFeed Yellow, all about the humble video stores we all used to visit when we needed a movie to do what it is that movies do to us. Part of that movie-watching experience just doesn’t seem the same anymore now that we don’t have to get up and physically go to the video store, driving five miles in the snow just to get there. There’s the agony of finding the movie you want has been rented, the ecstasy of discovering someone else has returned it, and the fun of watching a movie all together as a family (once you’d all agreed on something), since it was a time before everyone had screens in their pockets. And then, you had to take it back — but not before rewinding it or you’d get fined. Maybe misty eyes just comes with getting older, but this little YouTube vide (which was not rented from a store, either) makes me kind of pine for the old days.